Today I want to begin working on the sparkling colors in the glass candy dish. I will be using the same colors that I used previously: French Ultramarine Blue, Permanent Alizarin Crimson, Winsor Red, and New Gamboge. Because the colors will be a bit diluted as I work, I want to begin with strong, wet pigments. Stir up some of these colors in the corners of your paint wells and have them ready to go. Pay close attention to the values shown in the reference photo so that you can get them right the first time. With this method I don't want to have to go back and paint another glaze of color if I can prevent it. 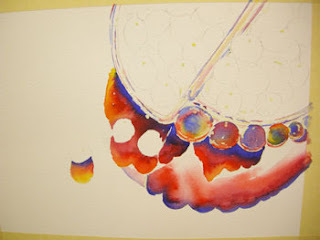 Lay some blue in the center of the large, round, glass shapes at the lower edge of the bowl. Quickly rinse your brush and load it with another color. Touch the edges of the blue here and there with this color. Rinse and clean your brush between each area so that you don't contaminate your brush and pull colors into areas where they don't belong. 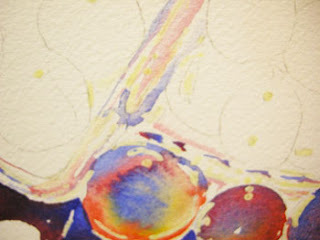 Continue on with adding the other colors, wet into wet, touching just the edges of the wet pigments. Allow them to soften and blend on their own. Avoid brushing, as this will make muddy, fussy-looking color applications.